Location: The kingdom of the Edain founded by Elros Tar-Minyatur on the island of Elenna. As a reward for their sufferings in the cause against Morgoth, the Valar, the Guardians of the World, granted to the Edain a land to dwell in, removed from the dangers of Middle-earth. Most of them, therefore, set sail over Sea, and guided by the Star of Eärendil came to the great Isle of Elenna, westernmost of all Mortal lands. There they founded the realm of Númenor. A land was made for the Edain to dwell in, neither part of Middle-earth nor of Valinor, for it was sundered from either by a wide sea; yet it was nearer to Valinor. It was raised by Ossë out of the depths of the Great Water, and it was established by Aulë and enriched by Yavanna; and the Eldar brought thither flowers and fountains out of Tol Eressëa. That land the Valar called Andor, the Land of Gift; and the Star of Eärendil shone bright in the West as a token that all was made ready, and as a guide over the sea; and Men marvelled to see that silver flame in the paths of the Sun. The island of Elenna, upon which was built the realm of Númenor. When Meneldur received the Sceptre he removed... and dwelt in the great house of the Kings in Armenelos. Near to the centre of the Mittalmar stood the tall mountain called the Meneltarma, Pillar of the Heavens, sacred to the worship of Eru Ilúvatar. [Aldarion spent time] near Rómenna, where was the chief haven of Númenor, the greatest shipyards, and the most skilled shipwrights. 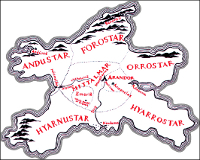 From the days of Tar-Aldarion there were great plantations in the Hyarrostar to furnish timber for shipbuilding. 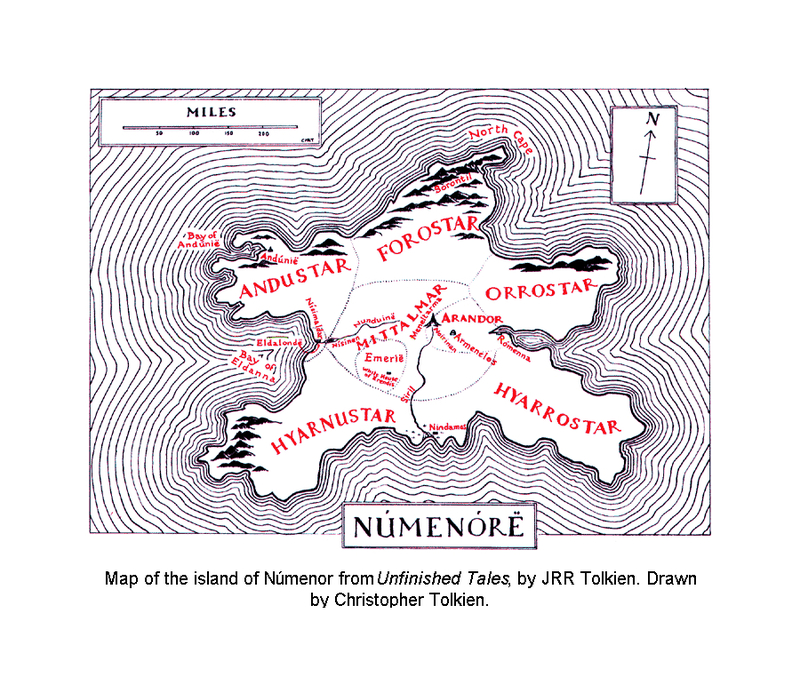 In Númenor all journeyed from place to place on horseback.... Therefore the roads of Númenor were for the most part unpaved..., and heavy cargoes were borne by sea. The chief and most ancient road suitable for wheels, ran from the greatest port, Rómenna in the east, to the royal city of Armenelos, and thence on to the Valley of the Tombs and the Meneltarma; and this road was early extended to Ondosto within the borders of the Forostar, and thence to Andúnië in the west. Along it passed wains bearing stone from the Northlands that was most esteemed for building, and timber in which the Westlands were rich. Some metals they found in Númenor, and as their cunning in mining and in smelting and smithying swiftly grew things of iron and copper became common.